Maastricht University organizes four times a year Open Days for prospective students. Twice for Master programmes and twice for Bachelor programmes. I had a chance to participate at the university side and help out on autumn Master's Open Day. I think I can skip now the part about how I get there as a member of Maastricht University promo team and came back to that later. I have a long experience with Open Days – I helped out at high school for several years and also at university. On the other hand I actually visited not that many open days, so I do not have much to compare it with. But never mind, my point is to introduce Master's Open day at School of Business and Economics at Maastricht University. At first, I must say that I liked the way it was organized. We got clear instructions a few days before on about an hour long meeting and than also via e-mail. As there were not that many people expected, all tables with programme presentations were located at AdFundum, as well as some refreshments. There was programme for the whole day. Everything started by an introduction in the large lecture hall – common for everybody. Then people spread around the whole building – there were special presentations of each programme in tutorial rooms and also general information tables at AdFundum. Visitors got a welcome package at the entrance – with some information about the school and also with the programme of the Open Day. We were nicely instructed, that we were not selling but presenting the University. SBE has definitely a lot to offer: Maastricht University is known of its PBL (Problem based learning) teaching method and internationality – everything is in English, because there are more that 60% of international students from about 40 countries. Especially bachelor programmes are rated among best in Europe. It's actually quite good idea to provide special Open Day for Master and Bachelor students. The programmes are different and people have also different questions. In addition to that, school that big can expect a lot of visitors and separate days can help with organization. As it was expected that a lot of people will spent there several hours, there were free drinks and refreshments provided – in the morning cake and sandwich for lunch. The end was scheduled to be at 16 o'clock, but most of the visitors left before 5 o'clock. How have I become part of university staff? 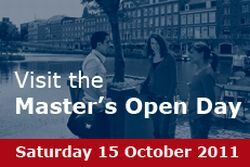 At the end of September, I got an e-mail from Veronika, who asked me to join Maastricht University promo team and represent Infonomics master program at Open day, that would take place on the 15th October. I replied with explanation of my position and we arranged a meeting at her office for the next week. There she told me, that the place for representing Infonomics programme is already taken by my classmate – actually I think it was the best choice – but I still can get some help out job around if I am interested. I surely was, so my point was to arrange all the bureaucracy staff like bank account and social security number. I was also really looking forward to help with organization. My place was to help out with catering – it may sound boring, but I had the whole day a lot to do I hope I will get also the opportunity to help out on Bachelor's Open Day on 19th November. Article last edited 15. 10. 2011, viewed: 3961-times.